The Manifesto Club has released a map detailing the 435 zones across London where normally legal activities are prohibited. Leafleting: handing out a leaflet in one of these areas without a licence can lead to a fine or prosecution (110 zones). shows that ordinary freedoms and legal protections have been suspended in large areas of public space. An everyday activity can now be an offence if you do it on the wrong street. 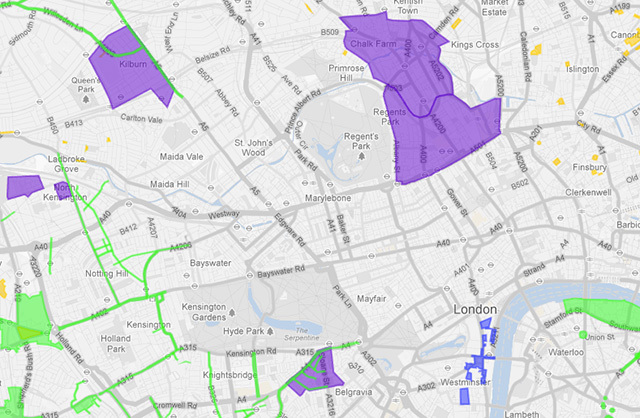 On a borough-by-borough level, it's best to avoid handing out flyers around Kensington & Chelsea (43 no-leafleting zones) while the most dog-unfriendly boroughs would appear to be Haringey and Islington (67 dog exclusion zones apiece). Of London's 33 local authorities, 14 have borough-wide alcohol restriction zones — though the victims are unlikely to be the poor family enjoying a bottle of Chablis with their picnic that the Daily Mail frets over. With precious little information on the street demarcating these zones, the map suggests that hundreds of innocent people could be unwittingly falling foul of bylaws; the Manifesto Club cites the case of one North Woolwich resident fined after walking her dog without a lead, though this does seem a rare case. But the image of a city whose citizens are treading an ever-narrowing line between their "ordinary freedoms" and the increasing clout of a censorious state should be disturbing for any Londoner.